it was a minor news item, but i think a pretty significant one in terms of anybody into cycling--and i mean generally, not just in terms of racing or personal health. i feel it notable enough to comment about it, and to offer up some additional links that i think you may find useful. those of you who've been to (or live in) Europe are probably familiar with the extensive bike community that exists there. compared to the US, there's more bikes, bicyclists, bike routes, bike tours, bike stops, bike appreciation, bike respect, and bike safety. in essence, it's just more of a bike culture. it's readily apparent in the way bikes are used in Europe. in the US, the majority of cyclists are recreational users who view their bicycles as forms of fitness and health; when we ride, we ride to get a workout. in contrast, in Europe, most people actually use their bicycles for other activities, like commuting to work (what a concept!) and shopping on errands (another concept! ); you don't have to be a fitness freak or a pro athlete to be riding one. i'm thinking Velib' would fit in with my vacation plans...i've been contemplating doing some races in Europe. partly because i still have relatives there, partly because i have fond memories of living there, partly because i feel comfortable as a tourist there, and largely because there are some pretty nice races there (triathlon and marathon--in particular, London Triathlon, London Marathon, Paris Marathon, Ironman Germany, Ironman 70.3 Denmark). what i'd really like to do is to do a race, and then do bicycle tours of the cities and towns--but casual, relaxed ones (as in beach cruisers as opposed to Tour de France racers) where i could take time to see the people, their culture, and the land (in ways you can't speeding by otherwise). the only thing stopping me right now is the cost (booooooo bad dollar-euro exchange rate!!! ), but i think it'd be fun. personally, i remember as a child living in Sweden that i rode a bicycle with family and friends to get to the beaches and fields in Falstebo for picnics and walks and play. the bikes were nothing fancy, we had no cycling gear, we always felt safe on the road...and bikes never got stolen, even though we had no locks. despite the growth in wealth and automobile consumption in Europe, this kind of bike atmosphere seems to be growing. if anything, it's being encouraged. 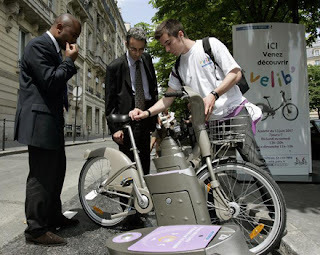 a notable example is in Paris, where the French government just initiated this past July 15 (not so coincidentally Bastille Day, the national holiday marking the start of the French Revolution) a program called Velib'. Velib' is not a novel concept in Europe. it isn't even the first of its kind in France. the idea of public bike rentals at readily accessible public bike stations for city use has been around for some time in places like Copenhagen, Amsterdam, Vienna, Salzburg, and (to my understanding) Berlin. in France, as indicated by the news reports, it's been operating in Lyons. the news articles says there's been a mixture of success (with Amsterdam being cited as a failure)--although, my personal experience has been that they're all still in operation and people are still using them (even in Amsterdam). since the bikes are rented and returned to specified public bike locations around the city, they are in a state of constant circulation. since there are a wide number of public bike stations throughout the city, people are never far away from one, making them convenient to use. significant investment was made to increase the number and size of bike paths and bike road lanes in Paris, making it safer to use a bicycle. another thing that may affect Velib' is that Paris is different from other cities. i know that in Amsterdam and Copenhagen, there already are pre-existing bike cultures where a vast number of people already own and insist on using their own bikes, meaning that their desire is not to rent a public bike from public bike stations, but rather to simply find and park their own bikes at the public bike stations. in Paris, in contrast, i don't think that the bike culture has as high a percentage of people with their own bikes, and so city residents may be more apt to rent public ones. in addition, i think that in Paris, because it is so expansive and so expensive, is likely to witness tourists turning to Velib' as a cheap, less intimidating form of travel around town relative to taxis, buses, or the metro. if anything, i think tourists will comprise the bulk of Velib' users. i hope Velib' works. it sounds like a good idea. and i'm going to encourage all the athlete friends i know who happen to be in Europe to give it a try (assuming i can get them to tone down their type-A adrenaline-fueled competitive fire and desire for speed and just...relaaaaaxxxxx). i know if i ever do a race there, i certainly will give Velib' a try. hey, anything for cycling, right? besides, not only is it encouraging a (relatively) more environmentally friendly wave of travel, but it's also reducing gas consumption, it's cheaper than other forms of public or private transport, it's convenient, it's easy, and it looks like a fun way to see Paris. rock and roll!